Melt butter. Stir in cocoa. 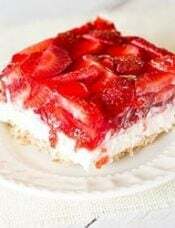 Alternately add powdered sugar and milk, beating on medium speed to spreading consistency. Add small additional amount of milk, if necessary (I did not need to). Stir in vanilla. Makes ~2 cups frosting. 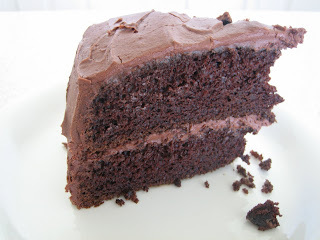 This chocolate frosting is to die for! Melt butter. Stir in cocoa. 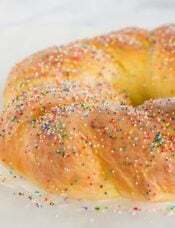 Alternately add powdered sugar and milk, beating on medium speed to spreading consistency. Add small additional amount of milk, if necessary. Stir in vanilla. 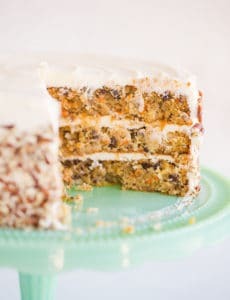 I would like to make this cake but the link above says page cannot be found on the hershey’s website. May you please post the cake recipe. Thanks. 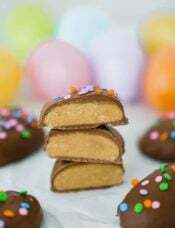 By the way, I have been enjoying your website and have saved a lot of recipes :) I came across your website looking for Dorie Greenspan’s recipes and America’s Test Kitchen and I am glad you give a review before I try the recipes. I am a frequent reader now of your blog since you also introduced me to the cookbooks that I have not heard of. So I checked a lot of books from the library to try the recipes. I am definitely enjoying the perfect scoop and the baked cookbook. I made this cake as a chocolate mint layer cake for my Son’s birthday and it came out fabulous, especially with the chocolate buttercream frosting. Had to drive 5 hours through a snowstorm to get it to him in VT and I think it was well worth the drive. We all love it! Made this cake today and it was a total flop. The cake sunk in the middle! I’ve been baking for 35 years and have NEVER had a cake sink. 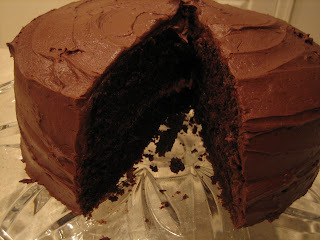 I quickly made a different chocolate cake recipe – so I controlled the “oven variable and it came out perfect! I was suspicious of the 2 cups of liquid – which is a lot for a cake – so I’m thinking the recipe is to blame. Won’t be making this one again. 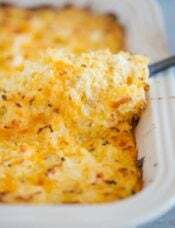 Life is too short and there are too many other great recipes out there..
Ditto! I am an experienced baker, who bakes all our bread from scratch every day. Followed recipe to the “T” & even set the timer for 5 min early to check it. When it hit 30min, timer went off, I turned light on to look inside the window….FLAT, FLAT, FLAT. Checked it & toothpick inserted came to clean. Continued to sink after removed from the oven. Grrrr. The only up shot is that now I don’t have to trim the domes off for my layer cake!!!!! I just made this today for my daughter’s 12th birthday, and it is fantastic! It stuck to the pan just a little, so I doubled the frosting recipe and used it as glue. There is no such thing as too much frosting, after all. The girls loved it. Hi Jesse, It should be 1&¾ cups of flour. 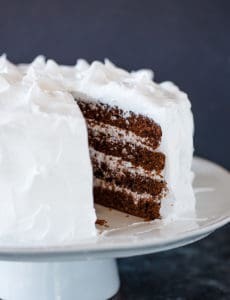 As for the cake not being flat, this is not uncommon with many cake recipes; they do not always bake up completely flat, which is why if you’re layering a cake, you will often need to slice off any domed top. You say you baked it in a 9.5″ pan. If you put ALL of the batter in one pan, then that would be why. This is meant to be divided between two 8″ or 9″ pans. I love ur website, i like to surf, read and imagining ur recipes. I’m new in baking, I’ve tried this hershey cake but my cake turn out to be another failed :'(. The surface wasn’t flat. Too many holes. And it takes more than hour to cook it. I baked in 9’5 inches pan. Tell me why i failed this easy cake? For dark chocolate lovers, you may want to try the variant of this cake I made. Since I had the Hershey’s Especially Dark cocoa powder in the house, I followed the directions on the back of the cocoa box. It’s almost exactly the same recipe, just with dark cocoa powder. There’s also a recipe for Especially Dark frosting on there too. I agree that this is the best chocolate cake ever. I made it a 3 layer cake and reduced the bake time to about 20 min. My cake was hideous, so I’ll have to work on that, but it was really decadent and the chocolate flavor is really bold. Oh! another tip, I usually choose butter over non-stick spray to grease my baking pans, but butter wasn’t enough, and my cakes stuck really badly. This is a super moist and sticky cake, so you will need a good amount of grease on your cake tin. Used the frosting as a ganache substitute on a chocolate bundt cake, made it a little looser. So delicious! This is hands down my favorite chocolate cake. It’s my go to chocolate cake. Sometimes I use the Hershey’s Special Dark cocoa powder, and it’s excellent. I like to frost with 7-minute icing. 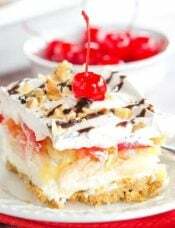 I forgot, i’m looking for something moist, richfull and with looots of frosting and ganache, something like that!! :( please Michelle, help me! 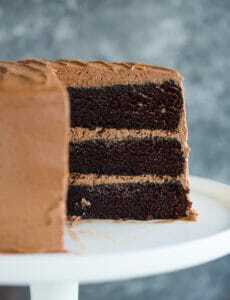 Anaisa, This is my favorite chocolate cake, believe it or not (I know the photo is old). I know it’s been a long time since people have commented, but I just discovered your recipes, thanks to pinterest! I was just curious about the Hershey’s cocoa. When I went to the store, there was only “Hershey’s unsweetend cocoa”. Is this what the recipe is calling for, or is there some standard “Hershey’s cocoa” that the store did not have? Thanks!! I’ll be attempting to make your Cherry Coke Float Cupcakes today! I am quite excited. Hi Jeannine, Yes you just want to use the regular Hershey’s unsweetened cocoa, that’s the one! I have used this cake recipe underneath of fondant before without any issues. Hi!! I’ve made this cake a couple times so far and loved it! The last time I made it I took it to a friend’s house and no one believed that I’d made the cake and the frosting from scratch, it was that good! I want to make it again to take to a friends house but I’ kind of in a time crunch. 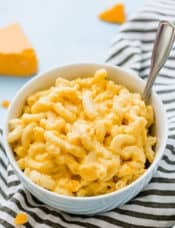 Could I make the batter the night before I need it and then bake it the next day or would this alter the texture since the batter wouldn’t be warm from the boiling water? Thoughts? Hi Sarah, I would not make the batter ahead of time and leave it refrigerated overnight. Even if you leave batter to sit on the counter for 30 minutes or so after mixing before getting it into the oven (I’ve done it! ), there is a significant difference. The cake doesn’t rise nearly as high, because when you initially mix everything the baking powder and baking soda are activated; after it sits for awhile, they are less potent. I love this recipe. The cake recipe is almost the exact same as one I have been using for years, the only difference is my recipe calls for 1 cup of hot coffee, and not boiling water. If you have not tried it, you should it is sooo good! and really brings out the chocolate flavor. I will try it with the boiling water to see how I like it, but I usually have coffee pretty close, even if I use instant.